Yet another work project seemed to take over my life for the last three weeks, and there was not a lot to blog about, and not enough time to spare anyway. It seems to happen like that a lot, so the thing to do now is make sure I get plenty of sewing and garden time in before the next big work-related chore. As far as my own sewing goes, I'm working on two projects right now; my Wild Goose Chase in pinks and browns, and the King's Crown blocks that are a longtime UFO from 2010 . I'm using the uncomplicated King's Crown blocks as leader-enders while I work on the blocks I kitted up for the WGC. Neither of them is a speedy project, but I'm making headway at last, after a lot of dithering about colours and settings. I really don't like making a set of blocks without knowing how I'm going to put them together. The times I've done that, I ended up wishing I'd not used some fabrics on the outer edges of the blocks, because it complicated choosing sashing or alternate block fabric. I really like to have at least a mud-map of what's going to happen next. So I wasn't going full steam ahead on the WGC blocks because I hadn't decided on what to do with them next. I also realied that there was something I didn't like about the blocks, but I couldn't put my finger on it. Finally it occurrred to me that I didn't like the pink triangles being so much lighter than the browns I was using. I want the value of all the prints to be similar, and the light pink and dark brown is off-putting. Nice, but not the effect I really wanted. or change that dark corner square to something that matches the value of the pink triangles. I have 15 blocks already finished, and lots more of the dark flying geese units made. In any case, I've decided that this is a good setting for the blocks I've already made; I'll make a few lighter brown blocks and throw them into the mix and see if I want to keep all the dark ones. If I truly don't like the ones I"ve made, I'll set them aside and start on ones with the colour values I want. I'm determined not to let this project stall, so I will keep making units and trying different things. I was going to say , it's not the way I usually work, but it is, really. It's just not the way I LIKE to work. This is how I attached the border print and made the design flow uninterrupted around the ecge. 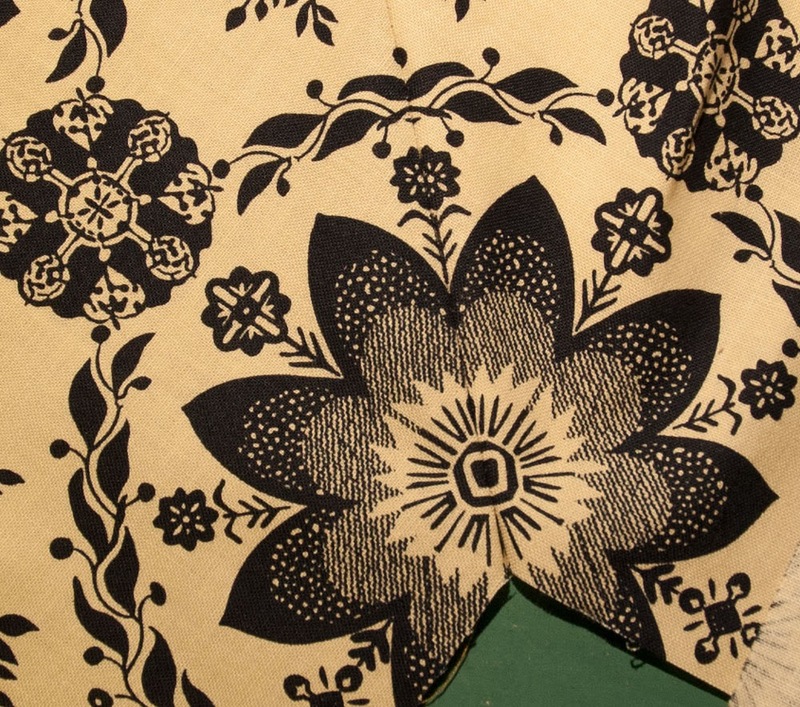 This works for patterns that are symmetrical, but would have to be modified for a border that didn't have mirror-image symmetry, like a floral vine or something. 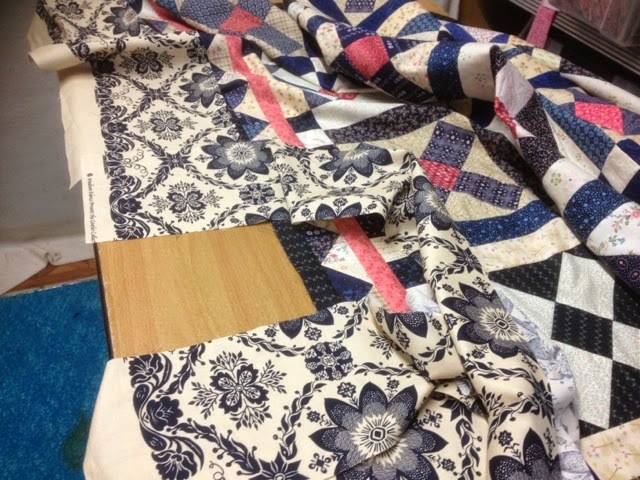 I pinned the corner in place on the quilt, and measured the strip along the side of the quilt until I got to the next corner. I made sure I had more fabric than I needed along the side , which meant going to the next repeat, and made the next mitred corner. I did this with both strips, so I had all the mitres pinned roughly. 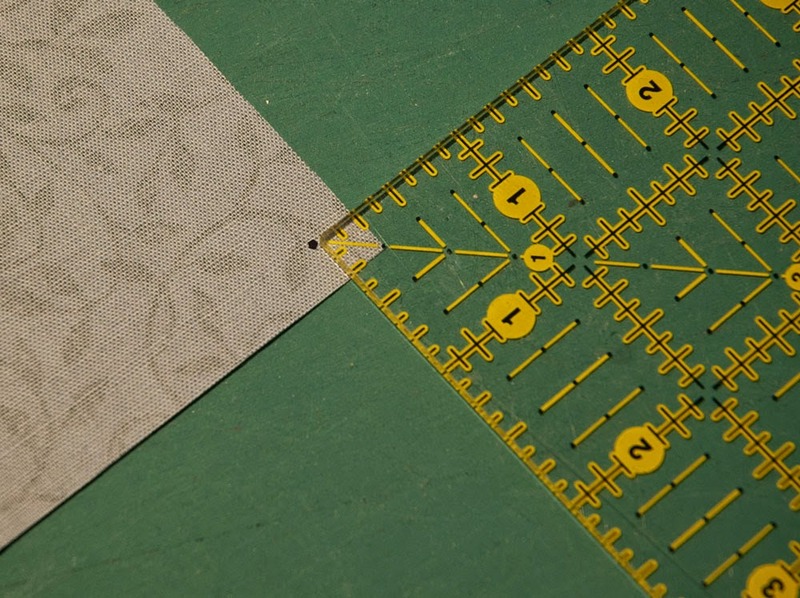 I didn't take proper pictures of the corners when I did the border, so I made a simple mitre from scraps to show how it's done. To get a perfect mitre I marked a 45° line on the fabric, using an easily recognisable part of the pattern as my guide, so I could do all four corners the same. In this case I used the centrre of the sunflower motif as an easy point of reference. 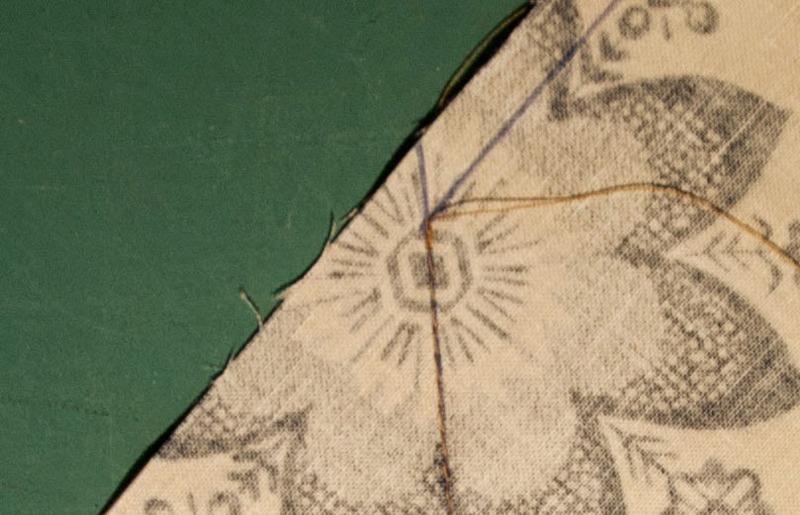 I then marked a quarter inch line on the inner edge of the border, so I would know to stop my seam short of the seam allowance, which is the key to a successful mitre.. I made sure the pattern on the underneath strip was lined up exactly with the one on top, and pinned in several places on the mitre line. 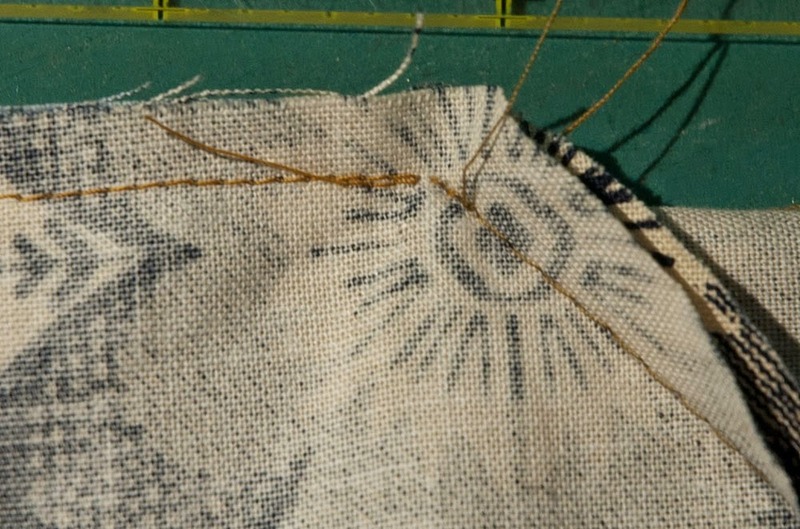 I stitched all four mitres (backstitching at the inner edge to keep the stitching from coming undone later). The extra fabric was trimmed off to give a quarter inch seam allowance. That mitre looks pretty good to me..
To join it to the quilt, I made a dot a quarter inch in from both sides of the corner of the quilt. I pinned the start of the mitre seam to this dot, and sewed the seam for a few inches. Then I sewed the other side, for a few inches only, again matching the start of the mitre seam to the dot. 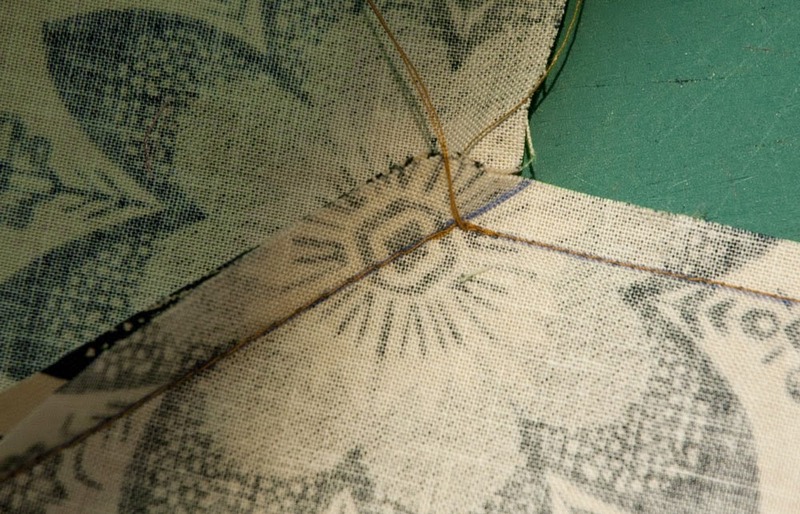 The reason I do this is because I want those corners joined correctly before I do anything else. If I need to unpick and reposition, it's only a few inches that I have to rip out. 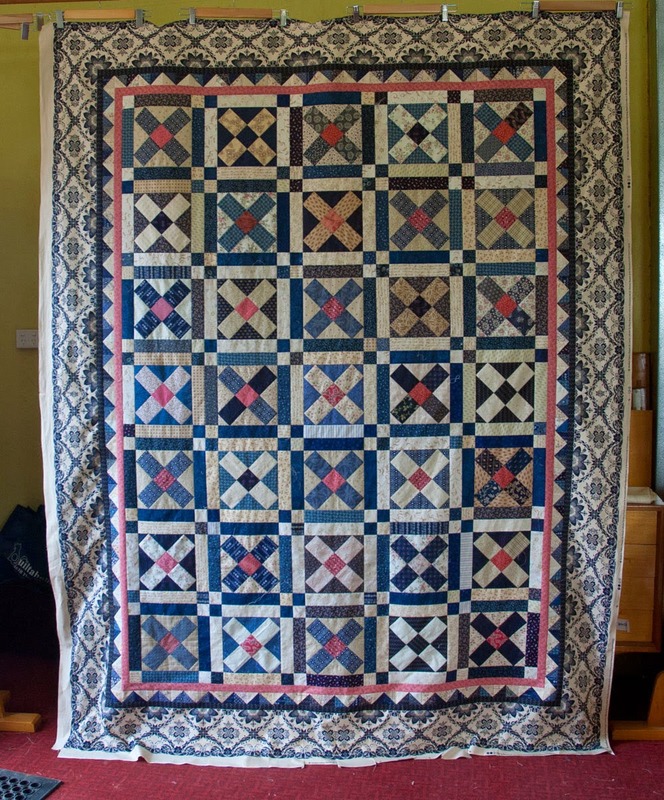 Once I had both corners joined, I pinned the first strip to the quilt working from each corner in towards the centre; as I got closer to the centre the excess fabric became apparent. 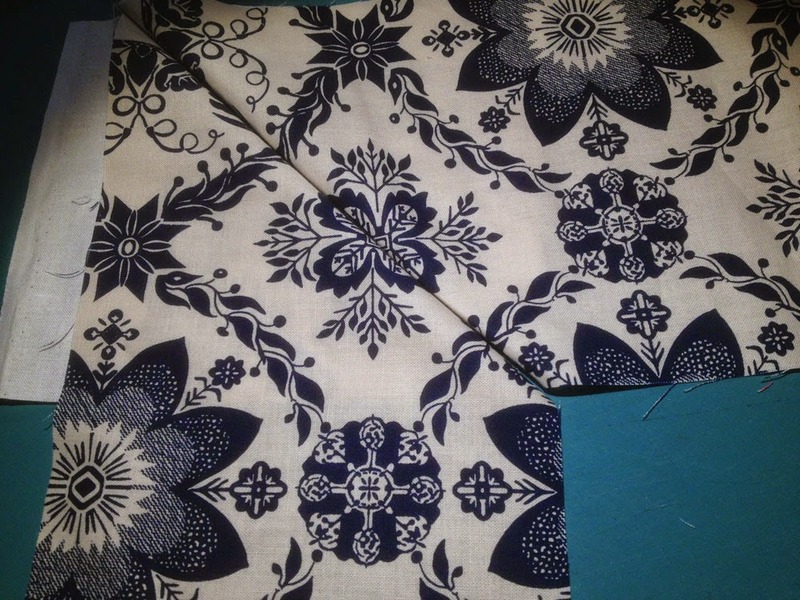 Then I kept pinning carefully, until a pleat could be formed to take up the extra fabric. I did this carefully to make sure the pattern was symmetrical either side of the pleat. I unpinned it from the quilt, for about 10" either side of the pleat, and pressed the pleat to one side, so there was a crease to follow as I stitched the seam. The extra fabric is trimmed away and the seam pressed open. 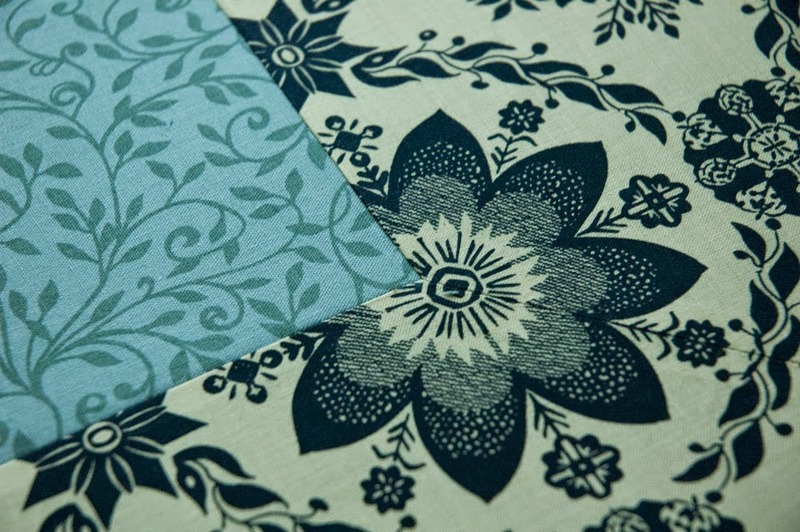 And there you have a border print that is perfect in the corners, and meets halfway forming a little joining pattern. Add the other strip to the other long side, and then join the side borders in exactly the same way. 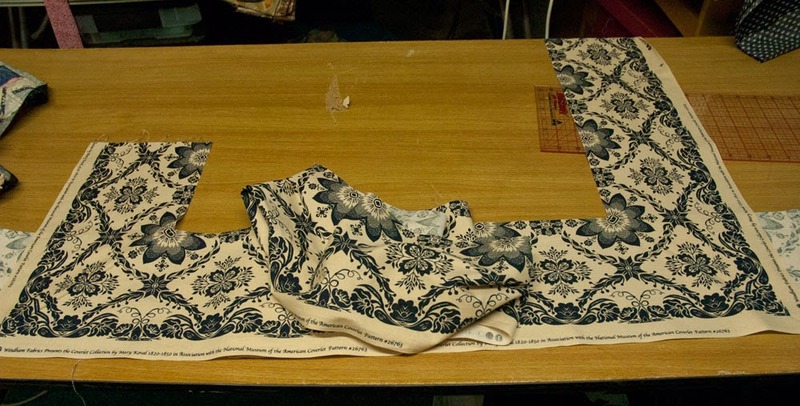 You'll be working with two strips on the side borders, instead of making a pleat you'll be forming a seam between the two strips, but the process is the same. It's a simple thing to do, but awkward because you're working with all the quilt bundled in your lap or on the table, but the key is to take it slowly and carefully and the result is well worth it. 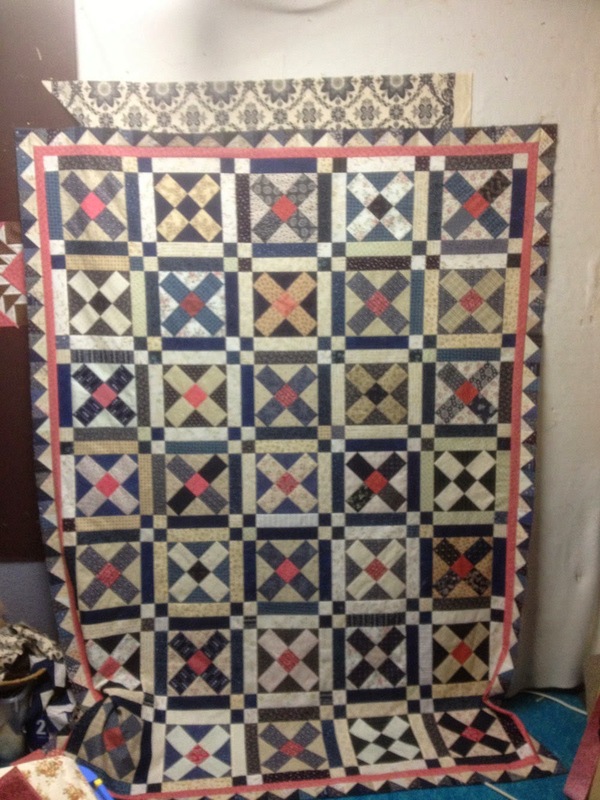 After a full night's work I finished the blue crosses quilt. 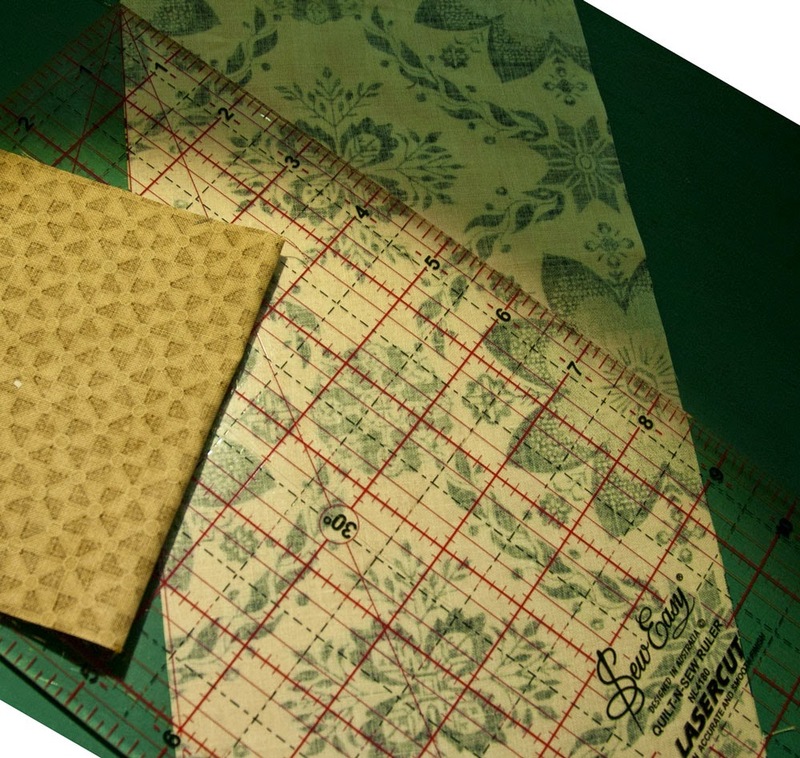 It would have been a whole lot easier if I hadn't chosen to use the border fabric, but I do love the effect of it. Just lately I seem to be giving myself a lot of design challenges with my UFOs, and it must be because I enjoy it. Otherwise why would I keep doing it? The corners are wonderful, I love the way the pattern continues; I enjoyed making these mitre seams, they weren't hard at all. The same can't be said for the rest of the border. I had serious doubts if I could finish it without adding another fabric, there just wasn't enough to do it easily. 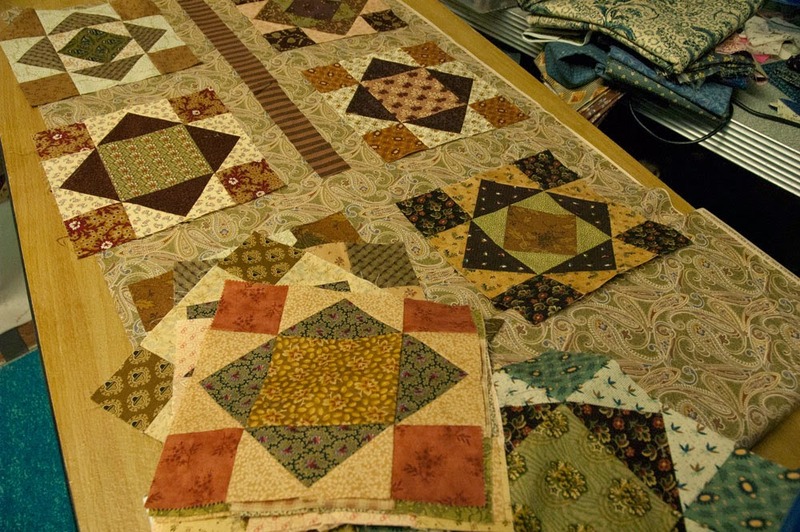 But I pieced in every last scrap, including the bits discarded from the mitred corners, and there was enough. 7 extra seams on that bottom piece to make it long enough. 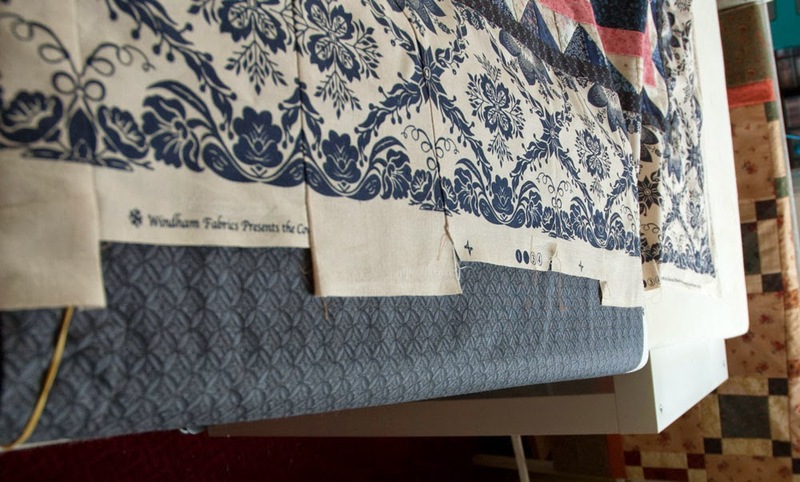 The border was printed on both edges of the coverlet fabric, but they didn't match exactly, which made joining the pieces harder than it should have been. There was fudging and a lot of fiddling, but I'm happy with the way it ended up. 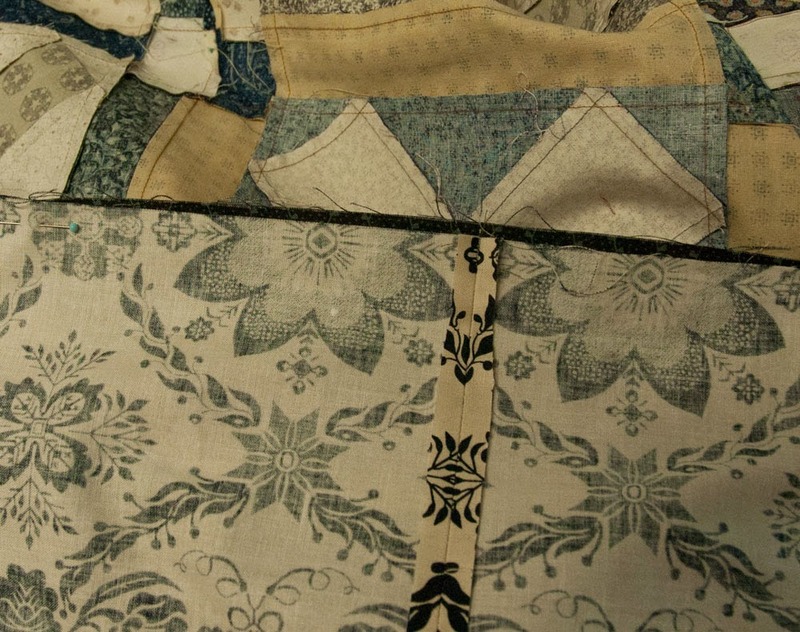 Once it's quilted the extra seams in the border will be less noticeable. My design wall is empty again!! What a lovely feeling. Now I'm going back to working on the Wild Goose Chase blocks, while I decide what to do next. The UFO list is getting smaller, only 25 left to go, but all of them are not easy finishes. Whatever I choose to work on will take a bit of effort but that's OK too. These King's Crown blocks are one possiblilty, there are 30 of them and plenty more cut out; I'm absolutely determined to set them together simply, and just put a border or two on them. Nothing complicated. I've fiddled and fudged and tried everything I can think of, and I'm this much short of the border print. I do have a plan though, so I'm going to sew all these borders on, and scrimp and save every last piece, and hopefully it will work out just fine. 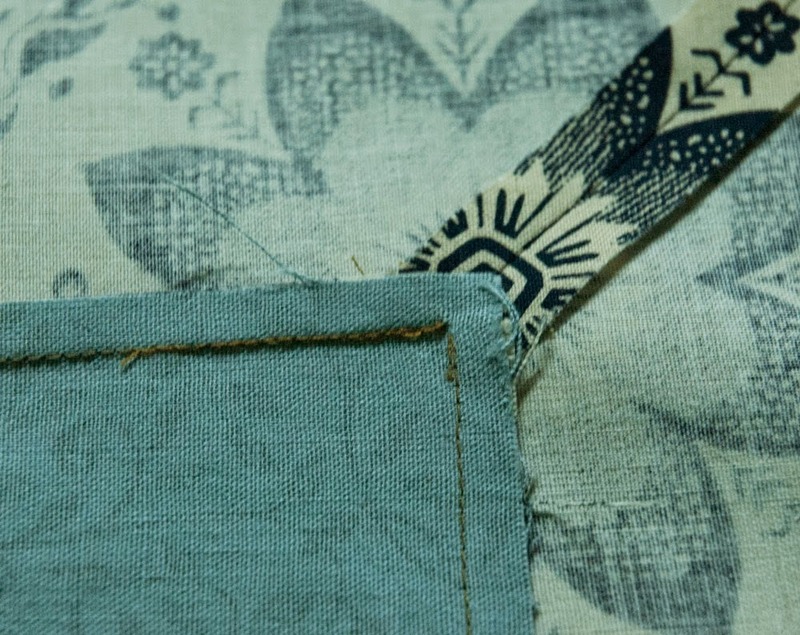 Matching the print in the corners takes up so much extra fabric, but it looks really good so the extra work will be worth it. I hope. We're off for lunch with the family, if we get back early enough I may be able to finish this tonight! Of course I had to juggle the units to get the Flying Geese border to fit. 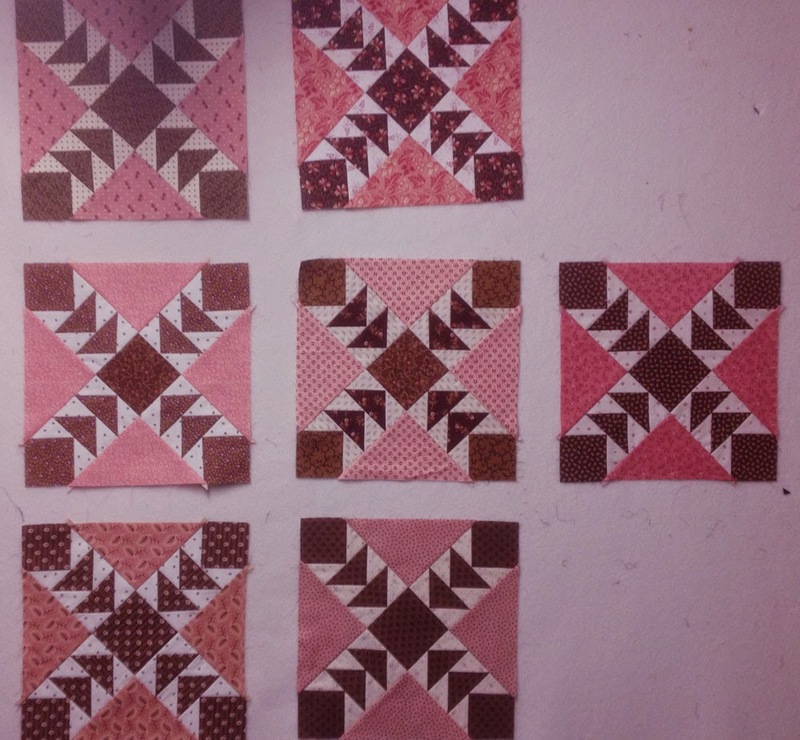 In one direction the length of the small pink border was 72", so I needed 24 Flying Geese. In the other direction, the border measured 52.5", which was 17.5 units. I wanted the corners to be the same, so I needed to have 18, or 17, not a half unit. I know I could have altered the pink border to make the overall measurement correct, but I didn't want to do that either. So I made the seams on the Flying Geese smaller, and the overall length of the pieced strip grew the extra 1.5" I needed. There were over 30 seams in that one border, so I didn't need to make a drastic change in the seam width, just a tad narrower did the trick. 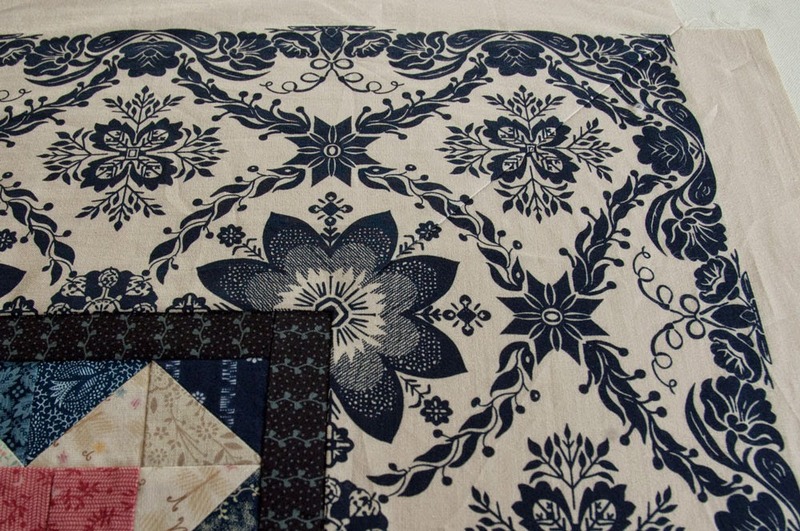 There will be a narrow indigo border next, and then the coverlet print. I'll have to work out a whole lot of problems on that as I go along. 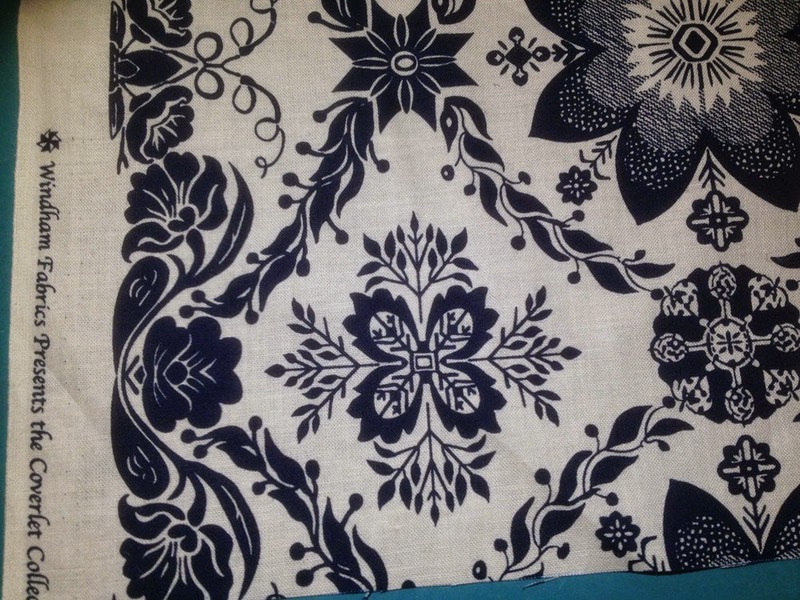 There's a border print along the edge of the fabric, so I'm going to try and use that along the outer edge. To do that I need to cut the strips along the length of the fabric. 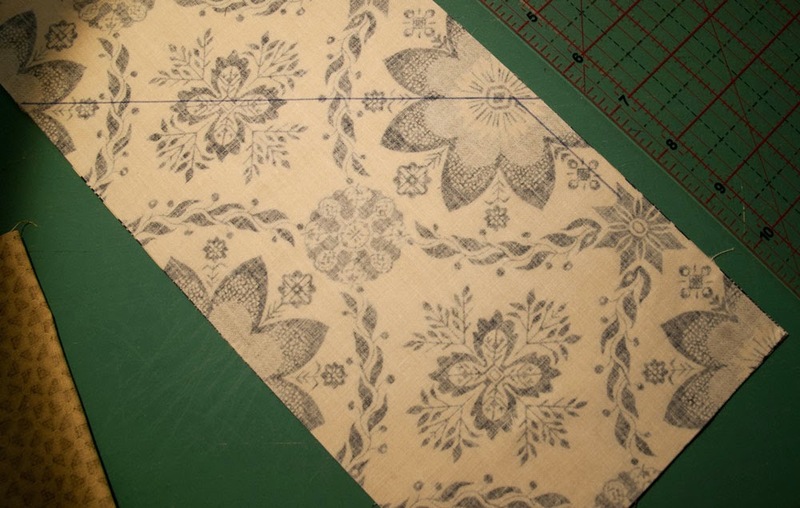 I'll need to use all the fabric I've got in that case, but I'm willing to do that because this border print also cuts down what I can use if I cut the strips widthways. I'd have to use three strips for the longer side, and that's a lot of joining and fudging to make it look good. I'd like to use the light motif as a corner; it has good symmetry and I'll be able to make it meet in a pleasing way. 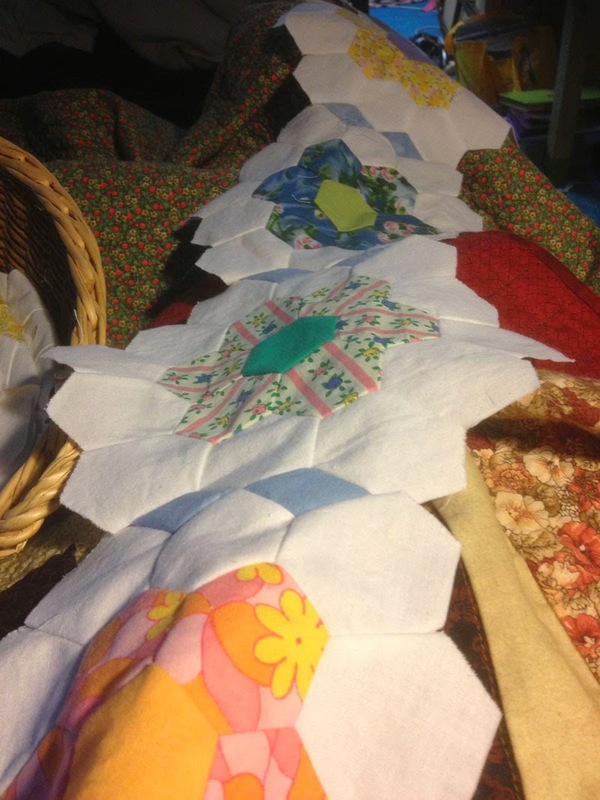 My vintage rosettes are now in rows, and I need to make two extra rosettes to finish the last row. Then I can cut out a lot of blue diamonds and triangles, and package each row into a ziplock bag with the right number of joining pieces. 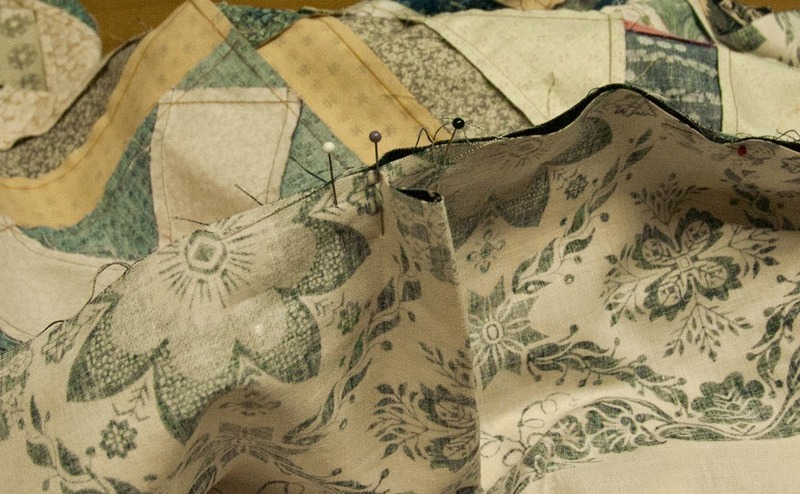 I'll work on them as I get time; I'll be able to take them with me to family dinners and get-togethers, and if I just keep at it then it will get done, one inch-long seam at a time.